Recently Rahul gandhi called Gujrat a #toffeemodel, really Mr. gandhi or shall I say Master Gandhi looking at the maturity of your brain. No one in this country respect you and you have earned. What is your dire need to prove your stupidity every time you speak. To be honest so far this seems to be you Model for India. Go and try to find out that your government has given Gujrat quite a many award, even UN has and one day you call it Toffee Model. Well call whatever you want but Toffee!! 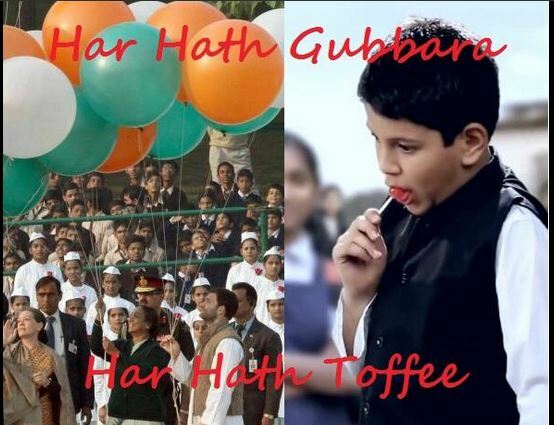 Seriously master Gandhi, why not lollipop. You open your mouth and lower the IQ of a whole nation. I am sure Modi aptly said “He is a child at heart because if he was mature he would have known that over 300 models of the Gujarat government has won toffees (trophies) from the United Nations and the Indian government”. On one hand congress gave a robot of a current PM and on another they are projecting one whose age is greater than his IQ. You leave me astonished every single instance you speak with your legend thoughts like “Poverty is a state of mind” like “Jupiter’s escape velocity”. Why don’t you, along with your Momma, Mannu Ji and DOGGYvijay, try to escape earth on that velocity? That will be something good that came out Congress in last 10 years. Why Indian comedians are going to miss Congress? With elections right on the door and seeing a week congress and stupid Rahul Gandhi #RaGa leading them, Indian comedians are getting sadder about how they will create jokes about UPA Govt. A lot of them created a good career joking about Congress, Sonia, Rahul and Manmohan. Where will they find new jokers like them. This hilarious video by All India Bakchod captures this theme perfectly. Watch it and subscribe to their channel on youtube: All India Bakchod. AAP: Hues and Cry! Blames! Distrust! and Disgust! India is a democracy and this so-called fact has been abused so much that it’s magnitude is unimaginable. In a democracy everyone has a right to say what one wants and this has led to a Politics of accusations, blames and condemnation of others. Congress says it’s BJP’s fault that country is facing so many challenges and BJP blames it on Congress. People got fed up of this sort of disgust, so they looked up to a new alternative AAP. They came as a revolution with promises to eradicate corruption, make Aam Aadmi’s (Common Man’s) life easier and serve the nation for a better future. But look what they are turning into, Mr. Kejriwal is seeking Modi and Rahul’s views. I am fine with Modi but Rahul Gandhi, now that is some low Mr. Arvind has hit. But that is not the disgusting part, the saddening thing is they are doing what rest of the political parties had been doing in the past. Have we learnt nothing in all these 66 years. Is it all about getting your Party in power? Is there nothing like some respect to an individual’s credentials? Mr. Kejriwal you are an IITian, an ex Asst. Commissioner and now CM of a state yet you have not proved yourself as an administrative leader. Mr Modi has been proving himself as a strong administrator and a proficient leader for last 13 years since 2001. In July 2007, he became the longest-serving Chief Minister in Gujarat’s history when he had been in power for 2,063 days continuously. I understand you just asked for his views but with this you start o involve yourself in the same genre of politicians which has been maligning this area since Independence. People have high hopes from you Sir and no one (who supports you or speak against you) wants you to let them down. AAP: Victory! Distraction! Promises! And Fake-Hype! It was a great day on which AAP scored 28 seats over Ruling party(8). It meant that people in Delhi are fed up of Corruption and malpractices of Ruling Party. It is fed up of dirty politics played in the name of Bharat Nirman. 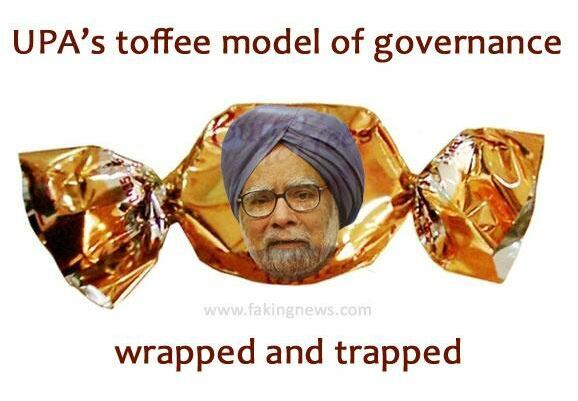 It was the day of change in Indian Politics, a new face was introduced to the otherwise not-for-people democracy. I loved their spirit to erupt corruption and give AAM AADMI what they need. Giving 20000L water and electricity for half the current prices is amazing. They are auditing the organizations and transferring Administrative officers and actively taking charge of their respective departments. Kudos to that!! I supported him not for 20000L water a month or electricity at cheap prices. I am not getting these anyways because I don’t live in Delhi anyways. But now it seems all that was in vain. See my point is very straight free water and electricity for low rates is a govt.’s responsibility towards it’s people and not the aim of a nation. Good they did it so early in their Political Career start but why is media hyping it so much? Focus on the basic thing for which this party came into existence. Corruption!! Why all of it has moved to only these two things and Kejriwal’s home. Come on for heaven’s sake it is Ok if he takes that CM residence and takes Innova, He is Chief Minister of a state and that too delhi, why so much anger on it? If you really wanna show rage show it on issues like being light on Corruption and how their supporters are getting bailed in the name of an alliance with ruling party. These faces looks familiar don’t they? We did use to share a lot of photos about ministers of Congress or BJP or BSP or SP, I guess these #AAP guys are no different or maybe this Vidhansabha/Sansad places are so comfortable that people fall asleep there. I am not saying this is end of the world but they should start early so that when time comes for Lok Sabha Elections they have something to tell that this is what can be done in 6 months with being in government if one has will. Let’s hope for the best keeping our fingers crossed!! Buck up AAP we are not going to let you get off the track.